Looking for more variety? With the addition of 65 poker chips or tokens, the Hanabi deck can also be used to play “Ikebana”, a hard to find competitive flower arranging game also by Antoine Bauza. Rules for this can be downloaded from BoardGameGeek (http://boardgamegeek.com/boardgame/70918/hanabi-ikebana). 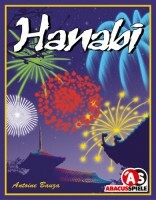 Although the box says Hanabi is for 2-5 players, you can play with more if you make a few modifications. We played with six, and dealt THREE cards each, instead of four. You can also introduce the ability to “pass” a limited number of times per game (I’d recommend twice with six), as there are a lot more turns in which to discard/play, which means the deck will be exhausted very quickly if you don’t do this. We have a house rule of always designating one side of your hand of cards to be the “old” side and the other to be the “new” side. For instance, when I am looking at the backs of the cards in my hand, the card furthest to my right is always the oldest (has been in my hand the longest), and any time I draw a new card to add it to my hand, it becomes the left-most card in my hand. This helps make discarding predictable for all of the other players, since they know which card I will be throwing away if I have to or choose to discard. It also insures the maximum amount of time for players to give me a clue about the 5 in my hand before it gets discarded. We intentionally do not give someone ANY clues about their hand when their oldest card needs to be discarded. This helps us not waste clues on someone who is holding multiple cards of the same number, when only one of those cards is actually safe to discard. Not knowing anything about the cards in your hand removes any temptation to attempt to play one that is unplayable. When first playing Hanabi, we spent a lot of time focusing on what the cards in our hands were. You’d move things around to remember what was a 2, or what was blue. After a few plays, it became clear that almost of equal importantance of learning what a card was, it was also helpful to recall what a card was not. For instance, when told early in the game that you have two 1 in your hand, you should remember that the other cards do not have the value 1. This becomes most important in the mid to late game, especially when told higher cards. If you were told you have 4s (or 5s) at some point, you were thus also told that the other cards in your hand are not 4s or 5s. This bit of information can help make the crucial decisions of what you can discard safely as the piles on the table fill up. Keeping this in mind, along with focusing on what is in the discard pile, can help you figure out what is in your hand a turn or two sooner than you may have otherwise. Thse extra few turns can go a long way to maximizing your score. Especially important in a 2 player game, don’t use the last clue if if can be at all avoided. Consider first if there is anything you know can be played or discarded, and is it really important to tell the other player that information right now. If there are no clues left for the other player they cannot tell you important information if needed leaving you blind. When you are down to one or no clues, if you know you have a player and a safe discard, it’s best to do your discard first and save your play for your next turn ( as long as you’re not too near the games end). Especially if the player next to you has a blind hand. By discarding first you give that player the option of giving a clue to save them from having to blindly discard. Now if they have no players and you want them to discard then go ahead and make your play. There is only one “five” card of each color. Discarding a five before its corresponding “four” has been played guarantees a less than perfect score. Establish a method of keeping your known fives separate from the rest of your hand. You can turn the cards 90 degrees. Or turn them upside down while keeping new or unknown cards oriented in the opposite direction. No matter how you do it, keep the fives from being discarded or played too soon. If you enjoy this game you should be aware that there is a deluxe version. This version is a tile set that has a nice weighty feel and will obviously outlast the cards. It is also very pretty in appearance. It is not cheap, but if you look around online you can usually get a good price on it. When playing through Hanabi, groups tend to feel they need more information than they have. When looking for more information, be sure to include a thorough examination of the discard pile. Since you know how many of each card is in the deck, knowing what is in the discard pile can be a big help in identifying cards in your hand. For instance, if you’re told that you have a 4 in your hand, and it’s towards the end of the game, you can often work out which 4 you must have, based on what has been played, what is in the discard pile, and what is in the other players’ hands. Additionally, if someone discards a non-one card, and someone has the other in their hand, you should make sure your clues get across that the card has become important and shouldn’t be discarded. When we play, we make a point of spreading out the discard pile (and sorting by color) to make it easier for people to determine what is (and isn’t) in the discard pile.